Requiem for an Aircraft, Farewell to a Pilot, by Dave Norton. Updated and reprinted from the original 2001 HTML article. The day was stiflingly warm, the sky that crystalline umbrella overhead that pilots call “Severe Clear”. The sun of a summer solstice reflected off the concrete ramp of Chino Airport. It blasted first degree burns on the normally shaded tender skin just above my eyelids, and that of the thousands of others there for the Chino Warbirds Airshow. Brother Dan and I could feel that this was a special day, somehow, and that we were in the presence of History. We didn’t realize that this would be the greatest gathering of flying WWII combat aircraft we would ever see. The aircraft were all there, the legendary P-51 Mustangs, the “fork-tailed devil” P-38 Lightnings, P-40 Warhawks, YAKs, gorgeous Spitfires, Hellcats, Wildcats, Corsairs, Messerschmitts, a Dauntless, a Zero and dozens of others, all the fighters that I grew up sketching in church, and replicating in stick and tissue in adolescence, dreaming of a life in the air. The trainers and observation planes appeared as well: L-5s, L-19s, even the Stearmans and Texans in which an entire generation of pilots learned to FLY! The bombers and transports were there, light, medium and heavy. The Harvards, Goonie Birds, Commandos, a Heinkel, sleek A-26s and B-26s, thumpy-looking B-25s, and the B-17 Flying Fortresses that carried the war to Hitler’s bunker. We had seen these before, and never tired of the grace with which they allowed their crews ever more control over the skies, and over the ground and sea below. These were not, however, what called to us that day. We were drawn to an aircraft so big as to defy imagination, the Boeing B-29 Superfortress. It was tied down on the ramp, nose toward the runway, and we took shelter beneath the monstrous silver wings while we waited for the fighters, the transports, the dive-bombers and medium bombers to yield their place in the sun in the crystalline sky around us. We could feel a tension building as the plane’s crew, a team of serious Army Air Force uniformed men, supermen really, larger than life, cleared the area and attached the tow tractor’s bar to the nosewheel. Slowly, the craft was brought onto the flightline, the two smaller nosewheels and four huge main wheels (taller than a man!) were chocked, and a guard with a fire extinguisher stood beneath each of the four mighty engines. As the flight crew ran through, walked through, crawled through their preflight checklist, red-flagged gust locks and rig pins were pulled from control surfaces, access hatches, gear locking mechanisms and pitot tubes, and all were presented below the cockpit for visual confirmation by the pilot. The pilot, young, brave, square-jawed, was totally involved in the process of bringing this winged warrior of a machine to life. He reached overhead, below, and on both sides, setting switches and circuit breakers, knobs and levers, bringing the four separate throttle levers to the prime position, checking and rechecking every switch and lever. We watched with fascination as the process continued, the 10 minutes seeming to take hours. Then the start sequence began. Number one engine, inboard, port side: the pilot called out the opened cockpit window “CLEAR LEFT!” The starter motor slowly rotated the prop through one revolution, two, three, clearing the cylinders of accumulated oil. The prop stopped. “CLEAR LEFT!” and again the giant prop started its halting journey full circle, hesitating as the individual cylinders came up on compression stroke, then BLAM! A mighty belch of heady white smoke erupted from the unsilenced exhaust manifold, followed by another then another. In fits and starts, the mighty prop is urged into continuous revolution. This is the first complete stuttering revolution of the engine under power. Each of the 18 coffee can-sized cylinders fired off in turn, igniting the rich mixture of fuel, air, and accumulated oil. The exhaust stacks instantly dumped a garage full of blue-white smoke into the swirling vortex trailing back behind the aircraft in a horizontal hurricane’s pinwheel. In the same manner each of the four 2,200 horsepower Wright R-3350-23 Duplex-Cyclone radial engines popped, belched, spat and bellowed its way through the transition from cold dead metal museum artworks to living creatures of Life and Power. Running roughly, belching and whumping and sounding like the hammers of Hell, the cacophony gradually segued into a low, menacing grumble. Each of the huge 4-blade propellers set separate Texas dust-devils free to run amok through those lucky enough to be in their wake. Hats were lost, parasols collapsed, small children held closely to their mother’s sides as hands covered ears in a vain attempt to exclude the punishing onslaught of sound. The detritus of 10,000 spectators, from ice-cream wrappers to printed programs to articles of clothing was scattered a hundred feet into the air, some to be carried away by thermals rising off the heated concrete taxiways. Those fortunate few in this wake whose life experience allows them to see, hear, feel and remember in their bones and in their souls what others cannot, those few stood transfixed, alternatively laughing and crying, weeping in gratitude for just being there at that time and place, and in gratefulness for those who came before. In the minutes that followed the engines came up to operating temperature, the huge pistons heating and expanding to close the clearances in the cylinders, reducing the din of clanking rattling pistons to a thrumming bass growl, but on a scale unimaginable. The Flight Engineer carefully monitored the life’s blood of each engine, pronounced each ready for full power. The mighty B-29 finally throttled up, the crew testing each engine in turn at peak rpm, cycling each prop through the range of pitch adjustment, running each aerodynamic control surface through its range of motion. All four mighty engines were brought to full power, the brakes released, beginning the slow inexorable acceleration to the moment of ROTATION! The mighty craft lifted its 133,000 pounds into the air with a ballet dancer’s balance of power and grace, returning once more to its element, a thin cold world of cloud and contrail. B-29 In Flight! Click image for full-sized graphic. Dan and I were simply transfixed. I recall seeing tears in Dan’s eyes, his face carrying an echo of the monumental price these men, these machines, paid for our freedom. I found myself weeping with the same unspoken emotions, and was surprised to look down and find that I was dancing on tip-toes, my entire body hovering about two inches off the ground, tap-tap-tapping on the concrete as a quarter might dance on a bass drum. It was a Moment! Dan and I hadn’t realized until recently that our uncle Clyde piloted just such a craft over Tokyo in the closing weeks of the war, delivering tens of thousands of the incendiary bombs that reduced entire cities to smoking ruins. When Clyde finally left the Air Force decades later, he gave me the flight bag (Aviator’s Kit B) which had accompanied him on these flights. It occupies a place of honor in my garage to this day. Clyde would never share his stories with us. He was a quiet and gentle man, one we just couldn’t picture as a hero. Yet, a hero he was. He did his duty, a duty that scarred him for life. In later years, as I came to understand this war and his role in it, I would ask him about those times. I could see a sullenness come over his face for just a moment. Then he’d ask me a question to change the subject. In these few exchanges, he made it clear that he had no pride in what he had done, felt no camaraderie with his fellow fliers, felt no honor in the devastation he had helped cause, and amazingly to me, Clyde felt no affection whatsoever for the aircraft which had brought him home safely from so many missions in harm’s way. Fortunately, Clyde went on to pilot one of the huge C-54 transports carrying food and medical supplies to an oppressed and starving population in West Berlin during the Berlin Airlift, in partial atonement for his service during the war. Clyde considered these humanitarian missions to be his legacy, the work of which he was most proud. Alzheimer’s took Uncle Clyde this year, Alzheimer’s and a cancer of the soul more deadly than any of the flesh. 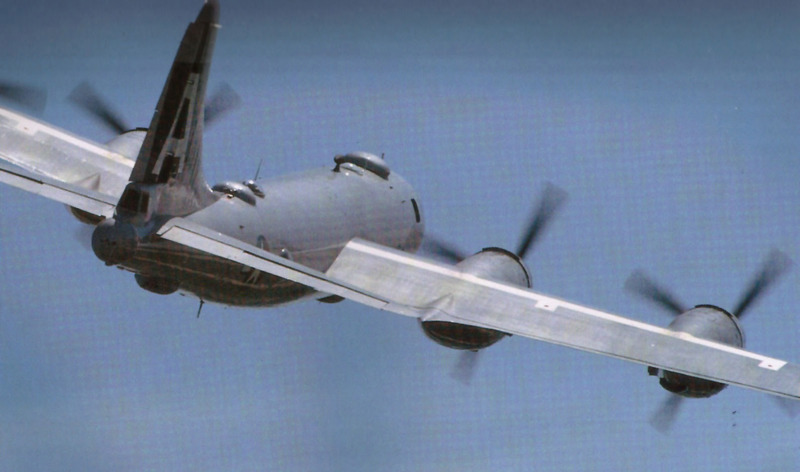 The last flying Superfortress is one human error or mechanical failure away from oblivion. The last living pilots will soon follow. Today we have little appreciation and no need for such men as these. Where ever will we find them, if need arises once again? In our past, such men, boys really, have risen. They’ve risen from the farmlands, from the mountain communities, the sprawling suburbs and crowded cities, from the ghettos and the universities, to step forward and serve. Until the time comes that such young warriors will no longer be called upon to protect us all from national greed and prejudices, both force of circumstance and their conviction and courage will bring them forth again. May the same wisdom and foresight that built the machines be judiciously and fairly applied to the leadership of those who fly them. Today I stand atop my little hill of aged wisdom with my eyes to the sky. The sights and sounds of that day, of those magnificently evil machines of war fade into history, and the larger-than-life men who flew them pass into memory. I remember, man and machine, and I am eternally grateful. Farewell, Lt. Col. Clyde David Douglass, USAF (Ret. ), and thank you for your service. May you rest is peace. This entry was posted in Dave Norton and tagged aviation, B-29, Guest, History, Remembrance by Dave Norton. Bookmark the permalink. Dave is a longtime Summitlake.com contributor. I now stand alone in memory of that day. This year my beloved brother Dan, as did our Uncle Clyde twelve years ago, passed into Alzheimers. May we never forget those whose sacrifices preserve our freedom. Dave, I am truly sorry to hear about Dan. Your wonderful article preserves remembrance, and is a wonderful tribute to all who served and fought for our freedom.